Chillers typically operate either by the absorption/refrigeration cycle or by vapor compression. 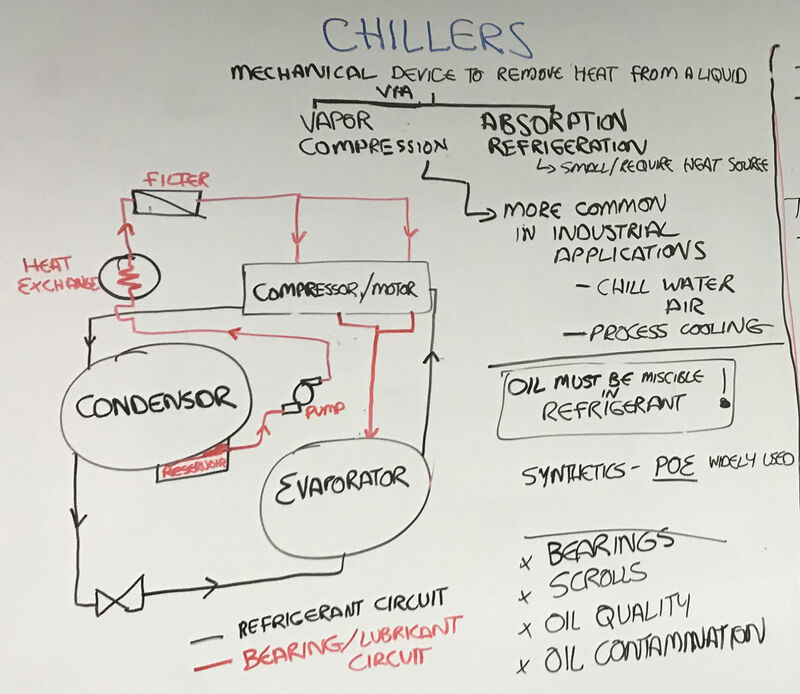 The absorption/refrigeration cycle is not widely used in industry these days so we will focus our attention on chillers that operate using the vapor compression technique. In this method, heat is absorbed by the refrigerant liquid, which causes it to boil and change from the liquid to the gas phase. The gas is then compressed back into a liquid as the heat is removed from the process. Much like a home air conditioner, the heat that is removed is typically removed outside of the facility, so there is a net heat transfer from the medium being chilled to the environment. These systems are typically sealed so refrigerant can't escape. For this reason it's logical to ask, why do I need oil analysis on a sealed system? The short answer is yes. The fluids in these systems still need to be moved around and compressed by pumps and scrolls. What we need to monitor is the condition of the bearings and other moving parts in the components that drive these systems. Specifically we are interested in monitoring the bearings, the scrolls, oil quality and oil contamination. One unique thing about compressors is that the lubricant must be miscible in the refrigerant that drives the system. Typically the manufacturer will recommend lubricating oils that are compatible with their systems and chosen refrigerants. Modern, ozone-friendly refrigerants often require synthetic oils. Polyol ester lubricants have become quite common in chiller systems. 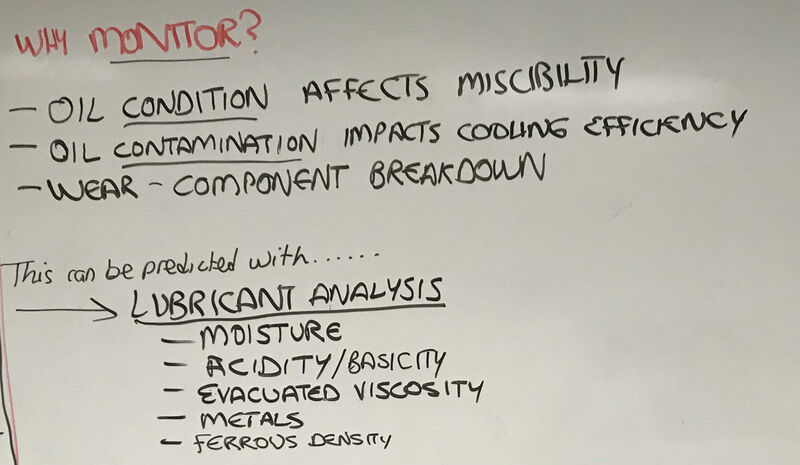 Oil contamination - if the oil is contaminated it can negatively affect the efficiency of the chiller. In particular water contamination can cause the chiller efficiency to decrease. What specific tests do we care about? Acidity/basicity - for chlorinated refrigerants like Freon or R-22, we recommend running a test for Total Acid Number (TAN). For ammonia-based systems we recommend running a test for Total Base Number (TBN). TAN can affect the miscibility of the lubricant in the refrigerant. Evacuated viscosity (40 degrees C) - kinematic viscosity is the resistance of a fluid to flow under the force of gravity. It is the most important physical trait of a lubricant. If the viscosity is off in a chiller system it can indicate that the separator is not working properly. Measuring viscosity in chiller systems can sometimes be difficult because the refrigerant dissolves in the lubricant and often must be outgassed before an accurate viscosity measurement can be obtained. This can take several hours. Fortunately this is not necessary if you use the Spectro Scientific MiniVisc 3000. The split capillary design of the MiniVisc allows lubricants to outgas as the measurement is being made. Ferrous density - a sharp increase in ferrous wear or a sharp increase in the size of ferrous particles is typically indicative of an abnormal wear situation that is getting worse. Monitoring ferrous particles allows maintenance personnel to intervene before a failure becomes catastrophic.